Last July, Atlanta got a taste of the middle infield of the future at Double-A Mississippi in Dansby Swanson and Ozzie Albies. And while that only lasted a month and a half before the former was called up to the Majors, fans will get their second look at the duo in action this spring. The Braves sent non-roster invites to Albies, southpaw Sean Newcomb and 18 other players for big league camp in Lake Buena Vista, Florida. Albies, the club's No. 2 prospect, tore up the Southern League last season before moving up to Triple-A Gwinnett. While the 20-year-old's offense suffered when he got to the new level, he added value with his glove by moving to second base. 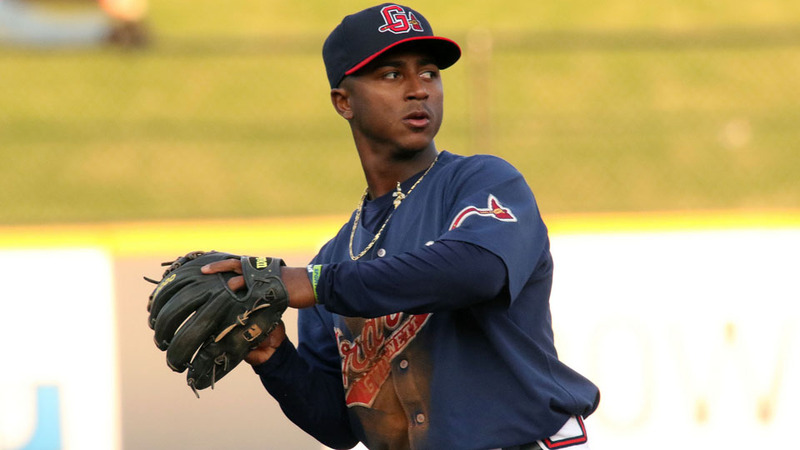 Albies' bat reignited when he returned to the M-Braves, where Swanson was waiting. MLB.com's No. 12 overall prospect finished the season with a composite .292 average, 53 RBIs and 30 stolen bases. Newcomb will return to camp for his second season with the Braves following his November 2015 trade from the Angels. Atlanta's No. 3 prospect (No. 47 overall) amassed an 8-7 record and a 3.86 ERA with 152 strikeouts and 71 walks in 140 innings over 27 starts. The club's No. 9 prospect, Travis Demeritte, will head to Spring Training following a midseason trade from the Rangers. The second baseman tallied career highs of nine homers and 28 RBIs in 123 games across Class A Advanced High Desert and Carolina. Continuing his steady rise through the system, No. 19 Dustin Peterson received his first big league camp invite. The outfielder led the system with 88 RBIs for Mississippi. Pitchers Patrick Weigel (No. 26) and A.J. Minter (No. 27) completed the list of ranked non-roster invitees. Right-hander Weigel went 11-6 with a 2.47 ERA in his first full season while lefty Minter was 1-0 with two saves and a 1.30 ERA after missing 2015 following Tommy John surgery. The Braves also invited Minor League pitchers Rhiner Cruz, Joel De La Cruz and Adam Kolarek. Completing the batteries will be catchers Blake Lalli, Joseph Odom, Braeden Schlehuber and Kade Scivicque. Major League right-handers Blaine Boyer and Jordan Walden will join left-handers John Danks, Sam Freeman and Eric O'Flaherty at camp. Veteran outfielder Emilio Bonifacio rounded out the list of non-roster invitees.